My name is Mona Minnie and InConnection.com is home to the journey that I have embarked upon to regain my health and happiness and learn to connect with myself again. Thank you for visiting my blog and sharing in my journey! In 2010 I weighed in at 310 pounds and was wearing a size 32 at an appointment I had with a bariatric surgeon. I was desperate to lose weight. I remember him telling me that the surgery would only be successful if I was ready for the change and motivated but that I also had to be in the right frame of mind. I left the appointment wondering if I was ready to make this decision. I ended up not getting the surgery and instead turned to traditional methods of losing weight and managed to lose thirty pounds in the next three years. I couldn’t understand how I could not lose more weight when I was eating at a calorie deficit. You see, I was no stranger to dieting and losing weight. I had been over-weight my entire life and in my early twenties I had managed to get my weight down to 105 pounds by exercising to excess and dieting – going from a size 16 to a size 4. And then, over the next thirty years I managed to gain all the weight I lost back and then some! I had various successes with weight loss over the next years but nothing significant. I hated journaling my food intake and never seemed to have enough success to keep my motivation going. I tried Weight Watchers several times as well as other popular diets. Looking back now though I realize that I just stopped caring about myself. I lost the connection with myself. On May 9, 2013 I was at the lowest point ever in my life. I weighed 280 pounds and I had numerous health problems that made it impossible to lead a fulfilling life. Diagnosed with high blood pressure, borderline diabetic, hypothyroidism, arthritis, skin issues and back pain related to bad posture, an anterior pelvic tilt, muscle imbalances, scoliosis and sacro-iliac joint dysfunction – I couldn’t move my body! I couldn’t walk up and down the stairs or even reach down to pick something up off the floor. I remember thinking back then that I couldn’t imagine what my life would be like in twenty years. I was 53 years old and felt like a cripple! I was also depressed and suffered from low self-esteem. I was ready for a change and resolved to do something about my situation. So I hit the Internet in search of gym shoes. I was going to finally make use of the Planet Fitness membership that I had been paying on. As is the case in Internet searches, one link lead to another and before I knew it I was reading about the benefits of going barefoot. And then that link lead to one about an Insulin Resistance test that you could try to see if you were sensitive to certain foods. Something was causing me to not be able to lose weight and since my mother had been Diabetic I figured I had nothing to lose. I started the test by eliminating all trigger foods from my diet for two weeks. The test instructions said I could add back one food type at a time and to monitor if any of my symptoms came back. But an amazing thing happened after only three days. I started feeling better…a lot better…and the scale started moving…down. I was intrigued and began researching carbohydrate intolerance. I learned that even though I was eating at a calorie deficit it was physically impossible for me to access the fat in my fat cells for energy if my blood sugar was too high. And grains and sugar were spiking my blood sugar…a lot. No wonder I wasn’t losing weight! Things were finally clicking into place and I continued on with the Insulin Resistance Test experiencing even more improvements. I added back fruit and dairy to my diet and just never added back the grains, sugar or processed foods. I started eating real food. Later I discovered that I was essentially following a Paleo/Primal/Wheat Belly diet. And the weight continued to drop and hasn’t stopped. I have lost a total of 133 pounds and still have about 50 pounds to lose. During the past year I went to physical therapy to address my muscle imbalances and to learn how to move my body again. Today I am happy to say that most of my medical issues have resolved and I am medication-free. My depression has lifted and my self-esteem has soared. Learning that I am sensitive to grains and sugar has been life-changing. I have learned to listen to what my body and mind need to be healthy and happy. I have learned to be in connection with myself. Congratulations Monaco. You are an inspiration !!! Thank you for visiting Moya and for your kind words! I am so glad I found this! I have been doing a lot of reading and everyone that has had such great success on Paleo/AIP lifestyles has been young and able to be active. I’m 52 and due to a botched knee replacement and my now 253 pound body exercise is really difficult if not impossible, other than swimming. I have done a 21 Day Sugar Detox ( Paleo) and felt better. I just wanted to know if someone my age had success. You give me hope, thank you for this blog Mona!! Mona is was truly an pleasure to meet with you yesterday and create the next part of your journey… finishing your Walsh College degree! Your weight loss story is beyond amazing and inspiring. I am excited to help finish your Walsh degree and share your story with students at Walsh College. And so …. my internet surfing continues. And then…. I came across you. (via Maffetone) And it was like reading about me. Even down to the age. SO I have a choice. Continue as I am – feeling unhealthy and unhappy and very very tired and sore! (NOT from the broken toe but just from life in general) Or I can change. Almost 5 years ago I made a massive change to my life – I left my 28 year marriage. I did it because I was so unhappy. It has been tough….. but every day my inner strength improves. I think – if I can do that …..well…. I can do this. I AM unhappy because nothing I seem to do helps. So I am about to undertake the 2 week test. Baby steps…… but at the same time hopefully giant leaps! Keep me in your thoughts….. 🙂 You are inspirational. Caroltyne, your comment couldn’t have come at a better time for me! It reminded me that I have the inner strength to do anything I set out to do! Some days are better than others but one thing that I have learned over the last two years is that change is a part of the process and that I need to embrace it and not fear it. You inspire me! The 2-Week Test was life-changing for me…I know it will be for you as well. You just told my story….even down to your age and weight! I have been grain/sugar free now for 8 months and have lost about 55 pounds so far but still have a lot to go. While this has been the easiest woe I have ever found, the weight loss is very slow and I sometimes go an entire month before the scale moves! I will stay the course because I truly look at this as a “lifestyle” change and not a “diet”, however, I was curious as to the time period for your weight loss. By the way, a big Congratulations!! 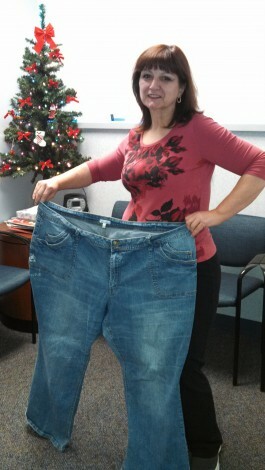 Hi Kathi, Thank you and congratulations on your weight-loss as well! I’ve lost a total of 150 pounds so far. The first 30 was prior to going grain-free over a three year period of time cutting fast food. Once I went grain-free and sugar-free it came off much faster. In the beginning though it was slow. About three months in I accidentally discovered intermittent fasting. Poor meal planning and knowing I couldn’t just stop at a fast food restaurant meant I would skip meals at times. And I hadn’t embraced cooking yet! Lol! And much to my surprise I did just fine…didn’t feel any hunger. At the same time I started physical therapy for my back issues and basically learned how to move my body again. So that was when I started losing 10-15 pounds a month. The second year the weight slowed down dramatically. I think my body was adjusting but also I found that I was cooking more and even though they were grain-free “treats” I think I over-indulged. So I am now realizing that I don’t have to have these things every day and now only have them on occasion. I test my blood sugar even though I am not diabetic (I am insulin resistant) when I cook a new recipe or just want to see how I react to certain foods. It’s how I realized I can only have a half a banana and not a whole banana! Now I am losing again but only 3-5 pounds a month. Thanks for the reply Mona. That’s awesome that you have changed your life so dramatically. I too lost 30 pounds before embarking upon the ketogenic way but I was always hungry when I was counting calories and always craving carbs (because I didn’t get rid of them). I actually love to cook and make my meals ahead of time so I will always have something healthy to eat, however, I haved contemplated the IF and have done the LeanGains way of 16 hours with an 8 hour feeding period but never longer than that. I may psyche myself up to try it a couple of days each week for 24 hours since you are right, not much hunger due to the high fat volume. I just wish I had found this woe long ago. I think I have such a broken metabolism from all the years of obesity and yo-yo-ing. Anyway, keep up the good work and thanks again! Hi Kathi, I am so sorry for my late reply. Somehow I didn’t get a notification. You are so much better than I am with planning ahead. It seems that is where I struggle the most. I find that if I set aside a day in the kitchen and batch cook freezer meals I can get more done. But then I am just not hungry some days and that is a struggle…because of old habits where you think you can’t skip meals. I think it all comes down to trusting what our bodies are telling us. I regret the lost years too but we are all on the right track now. Thank you! loved reading your comments, Mona…and then when I got to the replies, I almost started crying. It would seem that there is a whole family of women “my age” (54) and in the same physical condition dealing with the same issues. I have been losing and gaining the same 40-50 pounds for the last 30 years or so. the highest I’ve ever been is 205 and I am just about there again now. I KNOW that when I stop eating grains and sugars that I lose weight and I feel better. not just a little better, immensely better. I have been terribly depressed pretty much since I hit 50. For the first time in my life, I feel like there’s not much to look forward to in life. I have 2 beautiful little grandbabies and another 8 year old granddaughter acquired through my son’s marriage to her beautiful mommy who I adore. I am BLESSED to have a husband who loves me (35 years of marriage) and blessed with a fabulous job. I am filled with shame to whine about anything as I know I have so much more than so many others. When I stumbled upon your comments here it filled me with the desire and the motivation to give it another 2 weeks…I am going to do the 2 week test and have just made an appointment with a breast surgeon turned hormone expert who practices using bioidential hormones…hoping that will help with the depression, the brain fog, the lack of libido, the fatigue…you name it. At this moment I finally feel like I have hope for a decent future that doesn’t include limping out of bed and up and down the stairs and being in horrible pain every time my 2 year old grand daughter comes over because my back hurts so much. Please if any of you who’ve written here get this reply, cross your fingers and say just a little prayer if you’re a mind to…I hope I’m on my way. I wish we had a way of creating a little group where we could all inspire one another! (List serve??) Best wishes to all of you and thanks for the inspiration. Hi Kathy, OK now I have tears in my eyes! I can remember the day that was my turning point like it was yesterday and like you I felt like I couldn’t go on as I was. The depression is something I can relate to very well but I never thought it was related to the foods I was eating. Your journey is just beginning and you will feel better each and every day. One thing that helped me is to take the improvements as they come and to not stress about reaching the end goal…to enjoy the process. Especially this past year when my weight loss slowed down dramatically. So now I am trying to learn more about what is causing the stall and trying new things. I think a support group is a great idea! I already have a Facebook Page and post there most days. I could create a closed support group for those interested. Thanks for your comment! You can do this! Ok., I’m another 53 yo with the same challenges. I started lchf last July was doing well. I felt unstoppable, but then gave into holiday eating. I couldn’t wait to start back with the new year. However, I can’t seem to get back to it. I’ll start doing well for the day then fall back into old habits. Any advice to getting back on track? I know I will feel better, lose weight, etc so why can’t I do it? Hi Lisa! I am so sorry for not replying sooner to you! I’ve had an insane work schedule and recently made some changes that will free up some time for me. If you are eating high fat then that will help with cravings. My weight-loss stalled and what I realized is that I needed to keep things simple. I was making grain-free replacement foods and baking a lot. But that was actually adding more stress for me. Once I cut back on the baking my weight started dropping again. So maybe start there first by making simple meals with the right macros. I am eating 80% fat, 15% protein and 5% carbs now. I’m way overdo for a blog post but will be posting soon. I just stumbled on your blog from the Mafetone website. Everything you talked about could be me you’re talking about. I found out I am Insulin resistant so need to stay away from carbs and sugars. I did the HCG plan for several months and felt better as I lost 30 lbs and my pain decreased but now I am eating ‘normal’ again I feel the weight and pain creeping up. I want to try the Mafetone way or Paleo eating but am just very overwhelmed at where to start and how to plan my meals. I don’t get much support from my husband as he has seen my weight going up and down so doesn’t encourage me at all. I have started running and swimming again hoping it will help but now I’m hungry more. When my weight goes up I start getting depressed and just withdraw from people. I get very discourgaed and think to myself that I can’t do this! I would love to hear any suggestions you have or help where to start.